Bhubaneswar: The two day long state level flower show organized by Directorate of Horticulture, Odisha, Plant Lovers Association in collaboration with National Aluminium Company Limited (NALCO), concluded today at the Botanical Garden of Regional Plant Resource Centre (RPRC), Bhubaneswar. The event witnessed participation of more than 500 entries including Government institutions, Public Undertakings, Corporate & Industrial Houses, Private Farms, Nurseries, Individuals and Amateur flower growers, with a footfall of more than 1,50,000 visitors from the twin city of Bhubaneswar- Cuttack and other parts of the state. Attending the concluding ceremony of the biggest and the most beautiful flower show of the state as the chief guest, Dr. Tapan Kumar Chand, CMD, NALCO, accompanied by Smt Preeti Roy, President, Nalco Mahila Samiti, visited various sections of the exhibition, like cut-flower, flower arrangement, floral display, plant bazar, mini-garden, mini-forest, nurseries and exhibition stalls, appreciating the efforts of organizer. Dr. Chand also handed over the prizes to winners in various categories. “Going by the increasing number of participants and footfalls, the show has now become a people’s show and it symbolizes people’s love for nature. 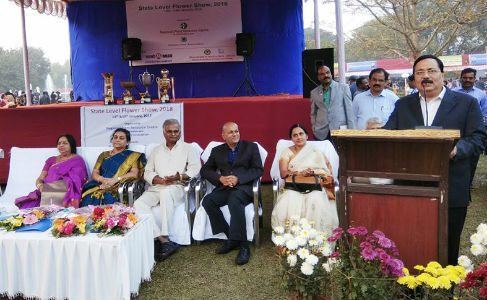 For NALCO as a responsible corporate, environment conservation has been deeply embedded in our core values and we are indeed happy to be part of this event as such events also generates awareness among the general public on environment conservation”, Dr. Chand said in his address at the concluding ceremony. Citing about the lustrous greenery created in the mined-out areas of NALCO Panchpatmali Bauxite Mines that has become exemplary in the mining industry of the country, Dr Chand also shared the company’s plans to undertaking various beautification projects throughout Odisha including development of Puri as part of Prime Minister’s Iconic Shrine Project. “With the implementation of avenue plantation jointly by NALCO and the state government between the twin cities of Cuttack and Bhubaneswar, we also plan to increase significantly the green cover of Bhubaneswar by encouraging horticulture activities. Our state capital will not only be a smart city but also green city”, he added. Among others, Dr. M. Muthukumar, IAS, Director of Horticulture, Dr H.S. Upadhyay, Chief Executive, RPRC, Prof. R. V. Raja Kumar, Director, IIT Bhubaneswar, Shri Khirod Pattnaik, President, Plant Lovers Association and other officials of RPRC were notably present on the occasion. NALCO has been associated with the show over the years as sponsor, which started way back in 1988.